Amazingly, 15,000 crocodiles have escaped from the farm where they were being kept..
A South African crocodile farm is facing a large problem after 15,000 of the animals escaped from the site and made their way into the nearby Limpopo River. The crocs made their dash for freedom when massive floodwaters forced the farmers to open their gates in an effort to avoid those waters from crushing the walls of the enclosures. Most of the animals made their way to the wild bush along the river, which could serve as the perfect home for the massive predators. A spokesperson for the farm says that they have managed to capture several thousand of the runaway crocs, but they estimated that about half of the escapees were still at large. The farm staff is rounding them up as quickly as they can, but considering the large number of animals that escaped, it is a challenging job. 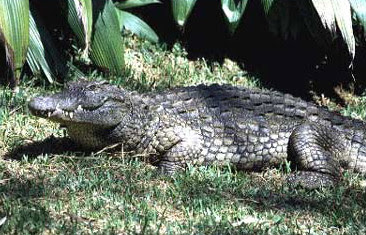 The escaped crocs are all Nile crocodiles, the species that is most common in Africa. Capable of growing up to 18 feet in length and weighing as much as 1700 pounds, they are the largest freshwater crocs in the world. They are also known for being voracious predators, attacking nearly any other animals (including humans) that wander into or near the waters where they make their home. The Limpopo River is one of the great waterways of southern Africa, meandering for more than 1000 miles across the region. The river flows into South Africa's northeast corner along the border of its famous Kruger National Park, a remote wilderness that would provide plenty of prey for the escaped crocs. The predators are not unknown to the Limpopo, but until now their numbers have been relatively small. That could change if these animals are not rounded up.